One of the National League’s top catchers during the 1930s. Gus and his younger brother, Frank, were the first Italian(no-)American brothers to play in the majors. Gus Mancuso made his major league debut with the St. Louis Cardinals in 1928. 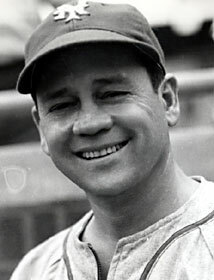 He was traded to the New York Giants in 1933 and remained there until 1938, when he spent one season with the Chicago Cubs, followed by a year with the Dodgers. In 1941, he returned for a short stint with St. Louis, was back with the Giants in 1942, and spent his last season, 1945, with the Philadelphia Phillies. Mancuso was one of the National League’s top catchers during the 1930s. He and his younger brother, Frank, were the first Italian American brothers to play in the majors, followed by the DiMaggios, the Torres, and the Conigliaros. In 1945, Mancuso retired after 17 years as a major league catcher with a .265 batting average, 53 homeruns, 543 RBIs and 1,194 hits. He batted over .300 three times. He hit .366 in 1930, and was selected to the All-Star team in 1935 and 1937. He was inducted into the Texas Sports Hall of Fame in 1981 and was elected to the National Italian American Sports Hall of Fame in 1984. Gus Mancuso died on October 26, 1984 in Houston, Texas.